- WWE has a new poll asking fans which team has a better chance of defeating SmackDown Tag Team Champions The Bludgeon Brothers at SummerSlam. As of this writing, 87% voted for The Bar while the rest voted for The New Day. Tuesday's SmackDown will feature The Bar vs. The New Day with the winners earning the SummerSlam title shot. - Big Cass' first independent appearance has been announced. He will be appearing at Big Time Wrestling's upcoming event on Friday, September 21st at the Spartanburg Memorial Auditorium in Spartanburg, SC. 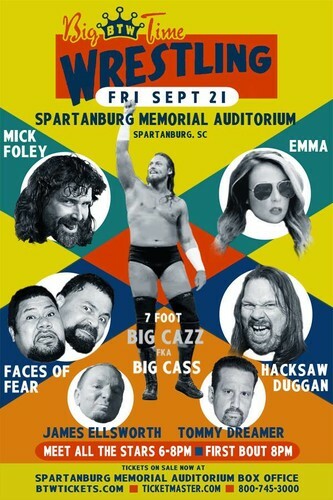 Cass is being advertised as "Big Cazz." Cass was released on June 20, 2018, so his 90-day non-compete expires days before the appearance. Emma, "Hacksaw" Jim Duggan, Meng, The Barbarian, Tommy Dreamer, James Ellsworth and WWE Hall of Famer Mick Foley are also advertised for the show. Whenever I’m in the ring, I hear the noise. I don’t run from the noise. I thrive in it. I hope Brooklyn’s ready to get loud because I’m ready to give them a show.